The train ride on the Luzern–Interlaken Express links two world-famous destinations. And time flies – faster than is desirable! The blame lies with the Alpine panorama, the turquoise lakes and the numerous waterfalls that adorn the countryside along the way. Lucerne and Interlaken are no doubt two of Switzerland’s most popular tourist destinations. 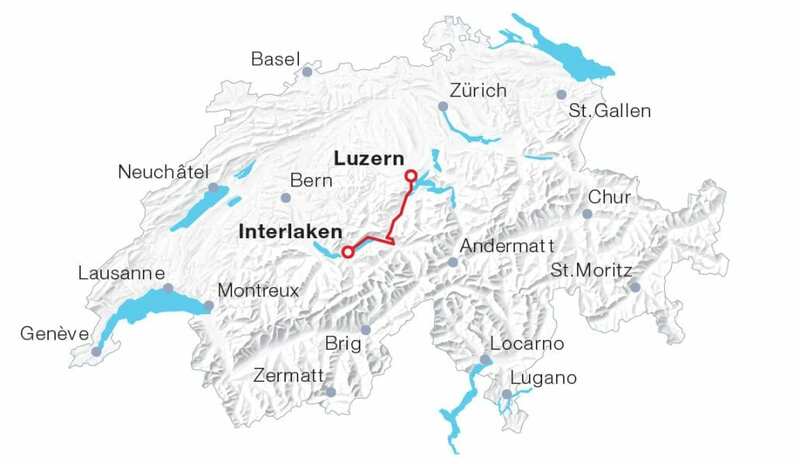 However, the most beautiful part is the route that connects them: climbing on board in Central Switzerland; sitting back and relaxing; arriving in the Jungfrau region duly impressed by breathtaking scenic splendour – all in just under two hours: That’s the Luzern–Interlaken Express. The panoramic train forms the first section of the GoldenPass Line, which continues from Interlaken to Montreux. The leg is also part of the Grand Train Tour of Switzerland. Along the way, the Premium panoramic train passes by five crystal clear mountain lakes as well as several waterfalls and rivers. Shortly before Meiringen, the train switches to cog drivetrain technology and winds its way up to the Brünig Pass. After the descent it arrives at Brienz, a popular starting point for boat cruises on the lake with the same name. Also well worth visiting: the open-air museum Ballenberg. There is a bistro coach where guests are treated to culinary delights. Guests that are not seated in the Bistro can use the “BistroOrder” app to order drinks and small snacks directly to the seat.